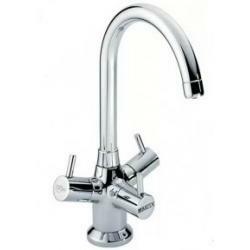 Enjoy fresh BRITA filtered water as well as normal hot and cold water from a stylish Brita kitchen water filter tap. The most convenient way to enjoy BRITA® filtered water is straight from a Brita 3 way water filter tap . BRITA filtration technology converts your mains water into fresh filtered BRITA water easily, efficiently and is far superior to a countertop jug which never seems to have quite enough in it. By fitting a Brita triflow, three way kitchen tap you will always have freshly purified great tasting drinking water readily available. BRITA Water Filters are a long established with a good reputation in the water filter market supplying quality filtration products to ensure safe & healthy drinking water. Each BRITA filter tap kit includes the P1000 filter cartridge for 3-6 months of filtration and which fits easily under the kitchen sink improving the taste whilst reducing the many impurities of tap water icluding chlorine & scale. A unique feature of the Brita water filter taps is the LED light situated in the handle which indicates the filter life, this is supported by an audible alarm when cartridge change becomes due. Conveninet, effective and designed to suit all styles of kitchen. Check out the best selling Brita Dolce and Brita Talori. Simple and space-saving installation of the replacement cartridge. Fits easily under the sink with a practical wall mounting bracket.